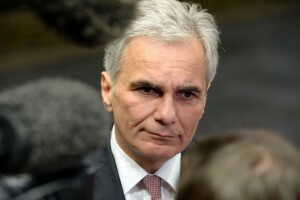 Austrian Chancellor Werner Faymann resigned on May 9 amid the ongoing migrant crisis in Europe and a lack of support within his own Social Democrat party. “This country needs a chancellor who has the party’s full support,” Faymann said in a statement. Vice Chancellor Reinhold Mitterlehner, of coalition partner People’s Party, was to take over until the government nominates a new candidate for presidential approval. Analysts said the abrupt resignation comes as Europe shifts to the right, threatening to push into obscurity some parties that have dominated post-World War II politics. Faymann had taken heat after the Social Democrats’ candidate was soundly defeated in the first round of presidential elections last month by a rival from the right-wing Euroskeptic Freedom Party. Even though president is largely a ceremonial office in Austria, the defeat was seen as a major embarrassment for the chancellor. Freedom Party candidate Norbert Hofer received 35 percent of the vote in the April 24 first round presidential vote to just over 10 percent each for the Social Democratic and People’s Party hopefuls. Hofer is the favorite going into the May 22 runoff against a former leader of the Green party running as an independent. The Social Democrats — who once commanded absolute majorities — have seen their popularity sink both in the 2013 national elections and in provincial votes. The centrist People’s Party — the other dominant post-World War II political force — saw a similar loss of support even before the migrant crisis hit last year. In both cases, much of the backing for the traditional parties has shifted to the right-wing Freedom Party. The Freedom Party has risen amid strong anti-migrant sentiment within Austria, but also has benefited from perceptions that the establishment parties are out of touch on other issues, including unemployment and terrorism. Recent polls show support for the Freedom Party has surged to 32 percent, compared with just over 20 percent for the government coalition. Austria’s political upheaval is the latest indication of the strength of anti-EU parties in Europe. In France, Marine Le Pen’s National Front party won European Parliament elections two years ago, and a recent poll had 80 percent of respondents saying they think she’ll make it to the second round of France’s 2017 presidential election. In the Netherlands, a poll this year had anti-EU populist Geert Wilders’ party leading in popularity. Hungary and Poland are already governed by Euroskeptic parties, while the Czech president regularly criticizes the EU. In Scandinavia and Finland, populist parties advocating national interests over EU authority are either in power or strongly represented in parliament. Germany’s anti-EU AfD party, is in eight state parliaments, scoring in the double digits last month in three state parliament elections.